Just over a week until the draw. Don’t miss out! To celebrate you, my loyal and dedicated followers, 14 Weeks Worth of Socks is going to have the first giveaway. YAY! 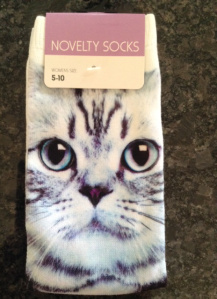 So in honour of the name of the blog and the fact that the internet is all about cats, I am giving away this fabulous pair of socks. Unfortunately for you men, these are women’s socks, so hopefully there is a special woman in your life that might like them. They are a women’s 5-10 sizing (that’s average foot size). To enter the draw, just comment on this post as to what you like about my blog and/or which post you particularly enjoyed or even what you’d like me to blog about in future. The winner will be chosen at random from those who commented on this post on the14th May 2014. I will ship them worldwide. Your posts are straightforward without any frills…love that! There is definitely more coming up about Hong Kong this month. And probably a little more about Tokyo and Tokyo Disney. There will definitely be a whole lot coming up around July about Disneyland and Disney Cruise Line. And the winner is…. Mani (A New Life Wandering) – http://anewlifewandering.com who commented over on the original posting (I included everyone here in the entries). Thanks for all the comments here and on the original post – it was awesome to hear from everyone.